One in five UK firms say their employees have been involved in an accident while driving for work due to using a mobile phone at the wheel, according to new RAC research. A year after increased penalties were introduced for using a handheld phone at the wheel, attitudes towards using a phone while driving haven't deterred everybody it would seem. Fines doubled from £100 to £200 and penalty point endorsements increased from three to six last year, but fleet drivers are still breaking this law regularly - with many involved in accidents as a consequence. The RAC revealed the findings from its survey of 1000 UK businesses, carried out across all fleet sizes and sectors. 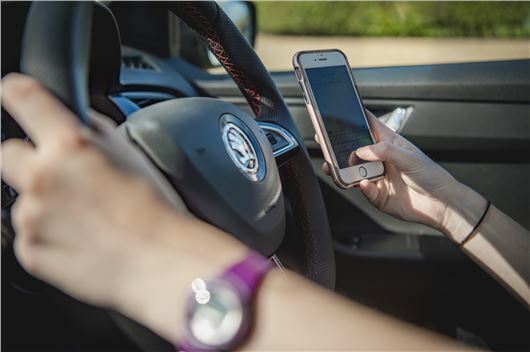 The research found 15 per cent of businesses admit their drivers are often involved in accidents while using a mobile phone, with five per cent saying it happened on a regular basis. One of the contributing factors could be that four in 10 businesses expect commercial drivers to answer calls while on the road, according to the RAC. For larger businesses (500 - 1000 employees) that figure rises to almost 50 per cent. However, almost a third of businesses don’t provide legally compliant hands-free kits, and 20 per cent have no policy for mobile phone use while driving. Strangely, the same survey asked businesses whether it was important to uphold their duty of care towards their company drivers, with 92 per cent agreeing that it was. Rod Dennis, from the RAC’s Be Phone Smart campaign, which was launched to encourage motorists to pledge not to use their handheld phone or smart device at the wheel, said the law is clear on the issue. He said: "Just because it’s legal to use a hands-free kit, it doesn’t necessarily means it’s always safe to do so, and it certainly shouldn’t be used to have long conference calls or to proactively make lots of calls on a long journey."